Halflight has it’s own PA system capable of delivering great sound for most venues, including marquees. We use a Mackie system with separate subs to provide clear highs and deep punching bass. All our gear is PAT tested. We also hold public liability insurance. Ask us for these docs for your venue if required. We have the resources and the technical know-how to get the sound just right for your venue. We know from experience this is one of the most important factors in hiring a band. If the sound is awful, it just doesn’t matter how good the band is. Sam Baly is a sound engineer, so he knows how to get the band sounding great just about anywhere. 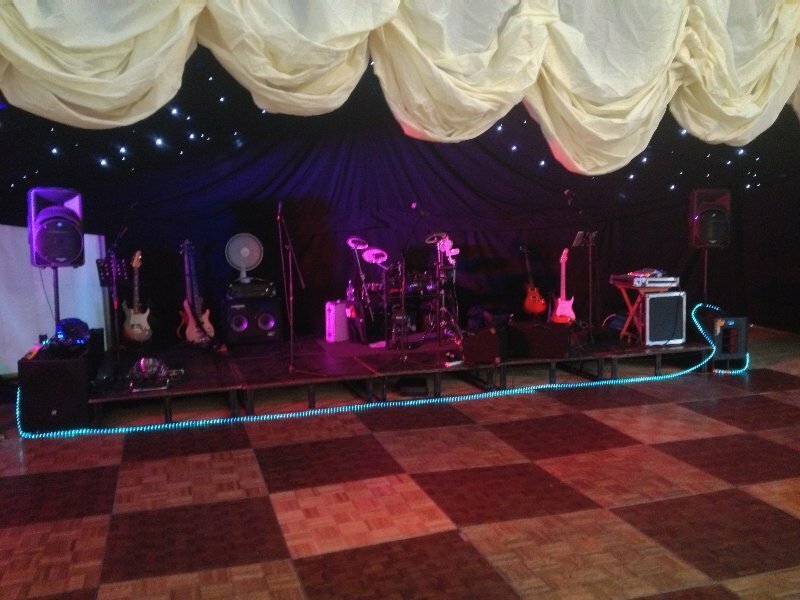 We’ll arrive at your event with plenty of time to set up and fully sound check the band so it’s right for the room. We use a digital mixer that allows us to recall settings for venues we play often which means it takes us very little time to set up if we’ve played your venue before. Even if we haven’t, it will only take us an hour. We have tools that allow us to analyse and tweak our sound based on your venue’s acoustics. This avoids squealing feedback. We also bring our own lighting to your event so that we’re lit up and so is the dancefloor. We’re adding to our gear all the time to ensure we can deliver the best possible sound and light experience.